Line-in. Plug in any device you desire. Knock your socks off sound: Attention obsessive audiophiles and hard-core music lovers. PLAY:5 is your speaker. It’s our biggest and best-sounding. So whether you’ve got a big room to fill with music or a discerning ear for divine sound, we’ve got you covered. Superior stereo sound: You’ll hear each separate instrument, voice, and sonic detail in all its glory. Six Class-D amplifiers with six dedicated speaker drivers deliver crystal clear, rich, deep, stereophonic sound with zero distortion. So go ahead and crank up the volume. Bass response: Thanks to three mighty woofers and a completely sealed architecture, PLAY:5 delivers big, precise bass response without reverb or echoes. 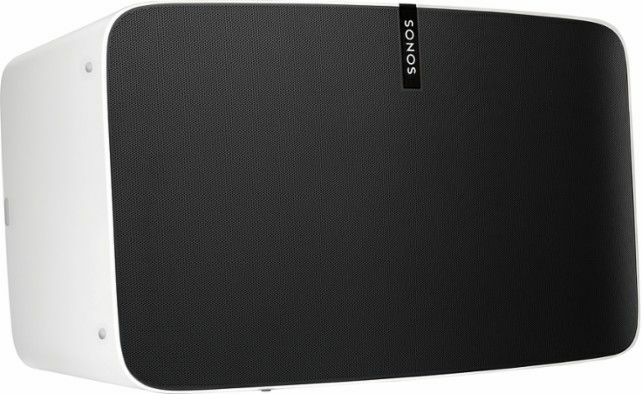 Trueplay, custom speaker-tuning for your PLAY:5: Sonos uses Trueplay tuning to make sure you get the very best sound out of your PLAY:5. No matter where you put it. Humidity resistant: We built PLAY:5 humidity resistant so you can enjoy your favorite songs in music-starved places like big master bathrooms and outdoor patios. All you need is WiFi access and a place to plug it in. Just remember, it’s not waterproof or weather resistant.